This is the start of a thread disclosing parts that vendors are selling that don't fit and ones that are correct. It's a different slant on the Good Part / Bad Part thread. It's very disappointing to order a part claimed to be exact reproduction and have it not even fit. Sometimes the part looks OK, but isn't made the correct size and sometimes the part isn't even close at all. I'm sure the vendors have them in stock and want to offload them even after they have heard they don't fit. I buy parts in quantity when starting a restoration and by the time you get to install it's too late for a return. 1969 Chevelle bucket seat chromed seat back release button. Bought from OPGI made by RestoParts which is their parent company. Clip is too big to fit into seatback hole and spring steel was not normalized so it's brittle and breaks easily. Solution: Chrome was peeling off my button, so I swapped the spring to the new button. Plasti-Chrome looked good and actual button matched original. 1969 Chevelle Muncie handle for Hurst Comp shifter. Vendor: SS396 Part requires spacer included, bolt are too long and have to be trimmed or will hit console in reverse. I installed the rubber floor shifter boot first onto the Hurst shifter body and then attached the handle and spacer. This worked and sealed the road trans tunnel hole. Used original boot and frame. Had to modify the sliding plastic cover that keeps stuff from falling into the console. The smaller part that slides left and right wasn't large enough for the conversion Muncie shifter handle. I used a file and enlarged it and all is good. I rate this part a good deal to get that tough looking Muncie shifter look and a shifter that shifts smoothly. Also comes with the chrome ball and locking nut. And a kit with the Hurst shifter is also available. Not much good about this part. The holes are in the wrong location, so good luck hearing the speakers. I called OPGI and to their credit they refunded the money and didn't want the part back. It looked good, but was worthless. 1969 Chevelle bucket seat headrest covers. Vendor: SS396 My bad on this one. I didn't know the headrests were heat molded at the factory and not covered. After I removed what I thought was the cover and the new cover was loose and looked terrible. I found a YouTube demonstration of recovering the headrests and you leave the headrest as is and place the cover on. Still doesn't fit correctly if you want original look. I'm going to try the OPGI completed heat molded unit and will report back on that. Same problem here. 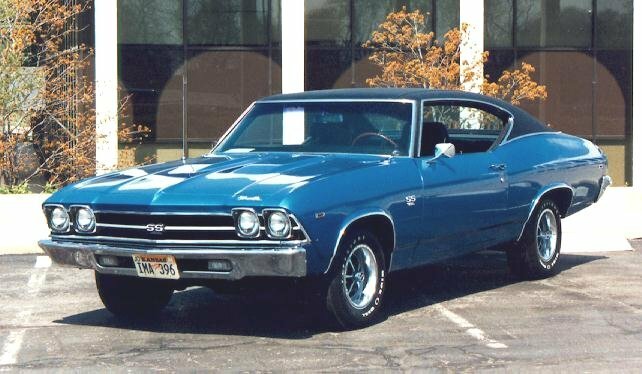 I purchased from OPGI 18 months ago the left and right outside mirrors for my 1970 Chevelle SS . Picture listed below. The passenger side mirror was so bad that it was always loose and constantly needed adjusting. This past weekend I went to the NSRA Show in Tampa Florida. On the way home doing 60 mph I heard a thump on the passenger side of the car. As I glanced over to look what the noise was I noticed the passenger mirror head had blown off the base. Fortunately there was no paint damage. I later learned that the mirror heads are pressed into the mounting bracket which results in a weak connection. Not the way to do it IMO. I had several problems in the past with parts manufactured by Resto Parts the parent company of OPGI. The problem is there are very few manufactures the make restoration parts. Most of the parts are made in China. Quality is constantly an issue. I'd rather have the original parts restored, purchase NOS or used parts as opposed to buying remanufactured resto parts. I like the idea of a thread with valuable info like this could be. Good comparisons of reproduction parts and originals, in an actual database format, with pictures. It's too big for the hole, there are too few slats and it doesn't have material over the entire vent that makes is function one way. I ended up repairing the one broken slat on my original unit instead of grinding this one down to fit and have a non original part that wouldn't even function correctly. Didn't we used to have a place for reviews of products? I think there was at one time but I can't seem to find it. It would be the perfect place for this if it is still around. I hope Dean will see this. He would know if there was a review section or if I am dreaming. I have my settings on full view. It is not there. Or at least not where I can find it.